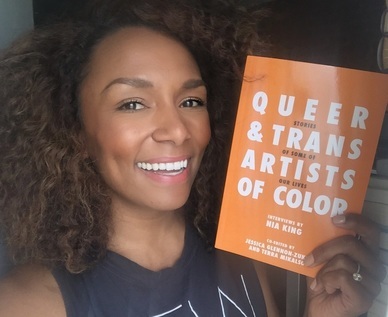 I finally got around to reading through Nia King’s book “Queer and Trans Artists of Color: Stories of Some of Our Lives” and I honestly could not love and recommend this book enough. There are so many honest and amazing stories from queer and trans artists of color who share their experiences of trying to or making it as an artist. The spectrum of jobs and experiences are amazing to read through and it’s refreshing to read through the stories told by the people living through them. Not only that but Nia is a really great interviewer – each conversation always covers an amazing array of topics. And each conversation often talked about similar issues (struggling to make it as an artist, gender, sexuality, the person’s story) but reading through each interview still felt fresh and nothing seemed repetitive. In addition, every interview reads really organically (props to the co-editors for helping the words go from the way people talk to paragraphs and sentences that are easy to read). I also know how much work Nia has and continues to regularly put into this project – from getting other queer and trans people of color to write transcripts (and compensating for the work), to having the interviews in audio form, to getting a wide range of people with different backgrounds and art forms to talk with. Her book comes from the interviews she does on her podcast We Want the Airwaves and if you have the ability to, I definitely recommend supporting her work! ← #Pride should be proclaiming that #BlackLivesMatter.